Caudelie Instant Detox Mask $39.00, 2.5 Oz. A good face mask is a must for any skin care routine no matter what skin type you are. There is something for everyone nowadays. If you have dry skin you can find a nourishing mask, for oily skin one that tones and strips the bad oils. For aging skin, something to firm and plump is ideal. I have combination/normal skin that has some dry spots, mostly around my nose in the winter time but goes all kinds of oily in the t-zone during the warmer months. Other then that my skin is pretty basic with the rare hormonal breakout on my chin from time to time. That is why this Caudelie Instant Detox Mask has been my mask of choice for the past few months as you would have seen in my Skin Care Routine video and post. I wanted to continue using it for a long while as I tend to do with my skin care products. This way I would be sure how I felt about it before giving my full opinion. I like a mask that tightens, doesn't take too long to set and gets deep into my pores. A clay mask is usually the way I'll go for this result. I love the color, the smell and the texture on this one! It sets in within a couple of minutes of slathering a thin layer over my face. Not much is needed for each use which makes it a great value for money especially as this stuff is not cheap at $39. 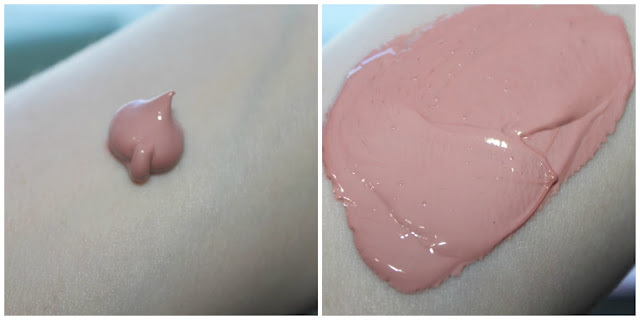 It's also not too thick in consistency so it's easy to squeeze out of the tube as well as spread evenly over the skin. The packaging is useful in this way with it's screw off bamboo looking lid and a dispenser hole that allots a perfect amount with each squeeze. Using this once a week has really kept my skin looking nice throughout all seasons. It seems to help tone my skin without stripping it when certain areas still need moisture. It even feels as though it hydrates a bit without overdoing that either. A mask like this is a really nice luxurious treat after a long week of workouts, traveling around the city and full face makeup days. It feels super nice to take off my makeup and give my skin a good pamper once a week and this really does take that up a notch. If you are looking for a new face mask to try, I highly recommend this one! Have you given this mask or any other Caudelie skin care products a try? Although this is the first of their line I've tried, I would love to give some others a go as they are said to have a really solid line! Are there any you'd recommend to me? If you haven't tried any yet, do you want to? Leave me a comment in the form below to let me know, I love hearing from you!